In just two decades, the number of states that have adopted external voting policies has boomed. Today, these policies, which allow emigrants to take part in home country elections from abroad, are widely found in Europe and Latin America. 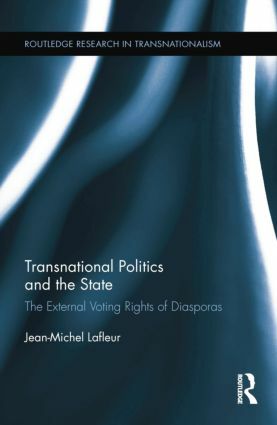 Looking at the cases of Italy, Mexico, and Bolivia, this book examines the motivations and consequences for states that enfranchise citizens abroad. This analysis sheds light on the impact of emigrants in home country politics, the motivations for emigrants to take part in the elections of a country where they no longer reside, and the consequences of this practice on receiving societies. With a multi-disciplinary approach, this book will appeal to scholars and students of sociology, political science, legal studies, international relations, migration, and transnationalism. Introduction. 1. Conceptualizing External Voting 2. Understanding the Development of External Voting Rights Worldwide: The Legal, Normative, and Socio-Political Arguments 3. Mexico: Enfranchising Emigrants Under Conditions of Democratic Transition 4. Italy: Electoral Benefits and the Enfranchisement of Citizens Abroad 5. Responding to the Call: The Implementation of External Voting and Voter Turnout Abroad 6. Affinities Across Borders: Emigrant Voters and the Formation of Political Opinions Abroad 7. "Do You Hear Me Now?" External Voting, Reserved Seats, and Emigrant Power in the Home and Host Societies. Conclusion. Appendix A: Methodology. Appendix B: Interview Details. Jean-Michel Lafleur is a Research Associate of the Belgian Fund for Scientific Research (FRS-FNRS) and a Associate Director at the Center for Ethnic and Migration Studies, Université de Liège, Belgium.